As far as I can recall, he knew them from school. He made them a video and Alphaquest was a thank you for that. Not sure when the vid was made, I only became BoC-aware when MHTRTC first appeared. I got shown the video sometime in 1998, and the only thing that has stuck in my memory was a POV shot moving down a corridor, with some skeletal graphics superimposed on top of the film footage. I think Nova Scotia Robots was the track he used...will ask my pal and see if he remembers. The visuals didn't suit the track, in my humble opinion...might be why it was never used. Not madly exciting, sadly...file under "art college pal makes cheap vid for musical mates". Possibility of you sharing some scans/pictures of your BOC Maxima and AFOT copies? Would be nice to add to bocpages. 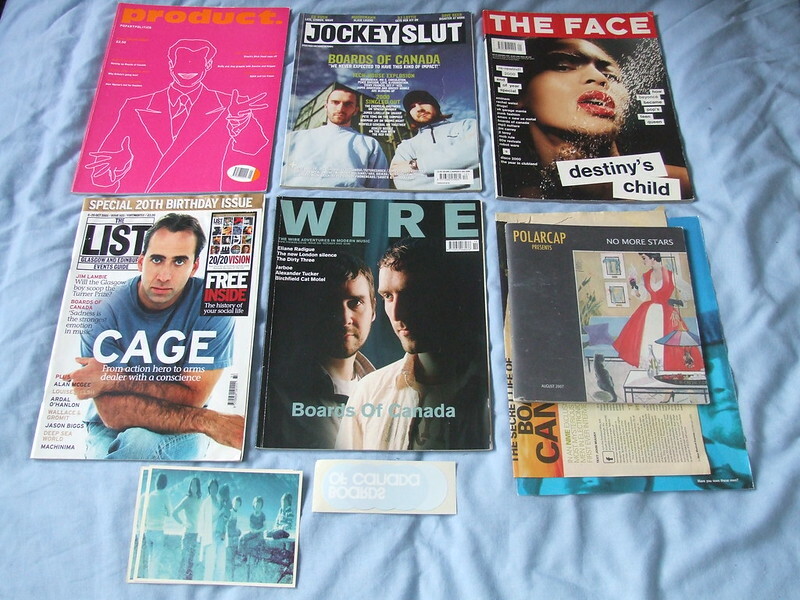 There's also a photo of all these magazines I sold to someone a couple of years back...I didn't take any scans, sorry. There are two things of note here, one is a magazine called Product (top left), which did a very short write-up when MHRTC came out. The piece was barely two pages long with a couple of photos taking up a quarter or so of the space. No 'new info' to impart, I do remember, just standard Warp blurb/stuff they found out on the internet. If you really wanna use those tape photos, feel free, but they are basically ILLEGAL DUBS of the BOC CANON, so I don't know what you can 'do' with that information really. You can actually see the page with the Product piece peeking out at the bottom right, underneath the NME article and exhibition catalogue. It has the text "Have you seen these men?" on it. Yep, I did buy two copies of Product when it came out and ripped one copy up to keep the article. I was (and still am) that sad. That's quite the collection you have/had. Are all of the interviews/ other published material in that little treasure trove currently scanned and on BoCpages from either other users or you? There are a couple there that I don't recognise. I'd like to help out with this. Can you contact me on Facebook or something? i think any member of this forum would love to own a original boc tape, including me! !